For 230 years however the farm and buildings were known as Schoongezight (Beautiful View) and as the home for several generations of the South African Wicht family. It’s history dates back to 1692 when Simon van der Stel, Governor of the Cape, granted 21 morgen (170,667 sq. meters) of virgin soil to three freed slaves - Manuel and Antonia of Angola, and Louis, of Bengal - and partly to Isaac Schryver. The latter, before taking out free papers, had been a Dutch East India Company soldier, a sergeant, later promoted to ensign. This was no parade-ground Sergeant however: Schryver could prospect for copper, chase run-away slaves, brave lions and barter cattle with the Hottentots. As Ensign, he had led a party of 22 men nigh on 500 miles into Hottentot territory, to come within five days' march of the shadowy Kobona - to be known, when later they collided with the Colonists, as Kaffers - and returned with all safe, and a thousand head of cattle besides - a record for any cattle-bartering expedition, especially since not all the bartering was beneficial for both parties. He married Marie Elizabeth van Coningshoven and together they named the property Schoongezight. Shortly after the marriage however wanderlust, or possibly shortage of capital, drove the adventurous ensign Schryver north to prospect for copper once again. The escapade was short-lived however. He returned home after a few years and eventually died on the farm, to be survived by his wife. Marie Elizabeth later married Jacob Groenewald and the farm remained in their family for nearly a century. In 1790 it passed to a distant relative named of C.J. Alberty, and was later transferred to C.J. 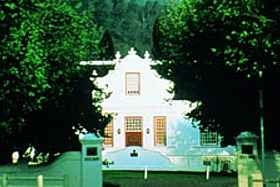 Fick - a relation of the Ficks who built the Burgerhuis on the Braak in Stellenbosch. Coenraad Fick set about building the present house in 1830. He lived until 1841, after which P.C. van der Bijl bought the farm. In 1849 the property passed on to his son, who in turn farmed there until his death in 1886. During 1887 a portion of Schoongezight was bought by Johan Hendrik Wicht, grandson of Hans Heinrich, the first Wicht to arrive in South Africa, and the second in a line of Johan Hendriks that continue till today. He subsequently bought further sections of the farm until in 1893 he owned the entire 21 morgen estate. The home with it’s tall slave bell and neo-classical main gable had a façade of great dignity. Almost completely hidden by oak trees, set as it is in a spacious courtyard formed by the outbuildings and the Jonkershoek Mountains far behind, it was a reminder of an elegant past. At the time the land that extended from Mostertsrdrift and across the road to Jonkerhoek, was still primarily a dairy farm. Johan Hendrik and his wife, Susanna Johanna Wentzel, set about following the example of other farmers in the region by promoting the production of wine. They had four children on the farm, their eldest son, once again named Johan Hendrik, being born there in 1888. Johan Hendrik the second died in 1908 and his son, Johan Hendrik the third, then just twenty, took hold of the reigns. After his Mother’s death in 1914 ownership of the property was transferred to him. In 1918 he married Johanna Claasens, the daughter of Mr. and Mrs. J.H. Claasens of Victoria West. As a farmer he had a wide range of interests ranging from being the chairman of the agricultural society, a member of the board of the South African Broadcasting Corporation, to being a banker as well as responsible for the creation of the Regiment Western Province, by dint of which, as Lieutenant Colonel in command of the regiment, he received the King George V1 Coronation Medal in 1937. Three of their four children were born at Schoongezicht . The first, Joan, was born the Fifteenth of February, 1917, the second, Louis, on the Fifteenth of March, 1919, and their son, also Johan Hendrik, on the Twentieth of December, 1920. Those however were the years of the great depression and farming was not easy. There was no market for fruit, and the Union Government had placed restrictions on wine production in South Africa. His father’s business sense had taught him that when farming proved unsuccessful there was no point try to battle the odds, so by the time Johan Hendrik the fourth was born the farm was in the process of being sold to the aristocratic Mrs. Violet English for the princely sum of £18,000. Another farm in the region was also known as Schoogezight. 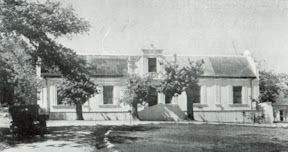 That piece of property belonged to John X. Merriman, the last prime minister of the Cape Colony before the Union of South Africa was formed in 1910, and the coincidence had been a bone of contention between the two families, so Mrs. English set about changing the name to Lanzerac, after a wine growing region in France, and producing wines under that name. Mrs. English died in 1929 and the farm was in the hands of the bank unti1 1935, when a Mr. Tribelhorn bought it. He in turn sold it to Angus Buchanan who enlarged and improved the cellars and in 1947 the first estate bottled wines were produced. His popular reds won a perpetual floating trophy for eight successive years and his white wines did nearly as well. It was Angus Buchanan who really put Lanzerac wines on the map and who by the mid-40’s was producing top-quality award-winning sherries and brandies as well. In 1958 he sold the farm to David Rawdon who spent a year converting fowl pens, stables, cowsheds and kraals into a hotel that opened its doors on August 26, 1959. The business suffered slightly during the 80’s and there was talk of developing it into timeshare, but it was saved in nick of time by Christo Wiese, ex-Matie, wine lover and wine lover in 1990, "because I wanted a wine farm". Wiese invested enough money to restore the buildings to the fine, simple style it had had in the past accustomed to. Today the oak trees still provide the same shade and the kitchens the same comfort they had grown accustomed to.